Technology has long been considered a resource-liberating mechanism, granting us better access to resources like information, food and energy. Yet what is often overlooked is the revolutionary impact technology can have on our ability to create art. Many artists are reacting to a world of accelerating change and rapid digitization through their work. Emerging artistic mediums like 3D printing, virtual reality and artificial intelligence are providing artists with unprecedented forms of self-expression. Many are also embracing the rise of intelligent machines and leveraging the man-machine symbiosis to create increasingly powerful works of art. In fact, advances in robotics and AI are challenging the very definition of what it means to be an artist: creating art is no longer exclusive to human beings. Artists’ styles and identities have always been influenced by the eras they live in. Today, technology is pushing the boundaries of creativity and sensory experience. Some artists are using digital tools to engage their viewers in the artistic experience. Described as a “new artistic language,” Chris Milk’s “The Treachery of Sanctuary” is a stunning example of digital art. 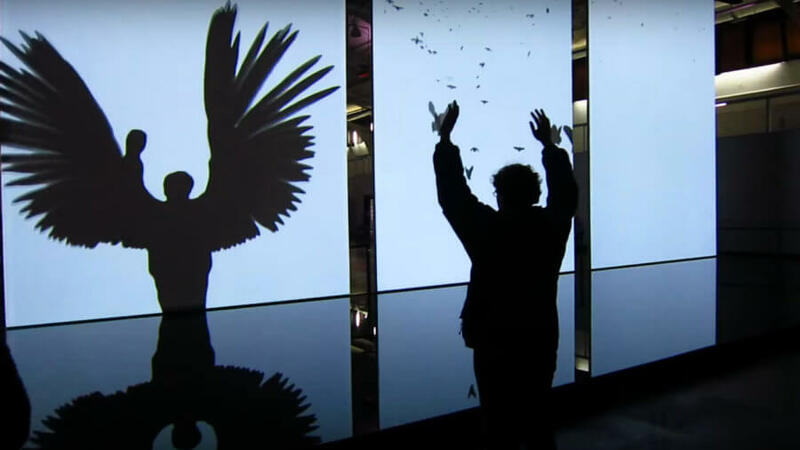 The installation uses projections of the participants’ own bodies to explore the creative process through digital birds, hence allowing participants to interact with the work and undergo a captivating experience. Without participants, the work of art is incomplete. Artist Eyal Gever is notable for writing algorithms of “epic events” and then 3D printing them with the world’s largest 3D printer. Gever believes that by using code and 3D printing, he can bring to life sculptures of explosions or waterfalls that would be impractical to produce by hand. In fact, Gever is collaborating with NASA and Made In Space on his latest project, #Laugh, to create a visualization of human laughter. This groundbreaking installation will be 3D printed on the International Space Station to become the first piece of artwork ever to be produced in space. Clearly, artists are no longer limited by traditional tools like paint, stencils or sculptures—they push their expressive urges and create increasingly immersive experiences. And what could possibly be a more immersive experience than virtual reality? Virtual reality could allow artists themselves to create art in a virtual space. Google Tilt Brush is a program that allows users, regardless of artistic background or experience, to create works of art in a three-dimensional virtual space. Described as “a new perspective in painting,” the Tilt Brush interface allows endless possibilities of artistic production. As exponentially growing tools like 3D printing and virtual reality become faster, cheaper and more accessible, we will see more renowned and amateur artists turn to them to create, express and capture their imaginations. Creativity and artistic expression have been considered features exclusive to human intelligence. One of the biggest criticisms of intelligent machines is that they lack the ability to “imagine” and “think” beyond their programming. Soon that may no longer be the case. Experts are attempting to program intelligent machines that create works of art. In June 2016, Google launched Magenta, a crowd-sourced research project that explores the use of machine learning in AI to create different forms of art, including music and visuals. Magenta will create interfaces and platforms that will allow artists with no coding or AI experience to use these tools to create their own work. Beyond this, Magenta could potentially program machines that will produce works of art on their own, without the influence of human artists. In many other similar projects, researchers are utilizing deep learning techniques to allow AI to create music inspired by the works of Johann Bach, create music inspired by the Beatles or write mournful poetry. Their creations are uncanny. As tech re-defines art, new questions will come up. Who is the real artist, for example, the programmers that coded the AI or the AI itself? Are the visual productions of Google’s AI a work of self-expression or a coincidental byproduct of complex algorithms? Can a machine really “express” itself if it isn’t conscious? Can robot artists, such as Paul, the Robot, be considered creative without the capacity to truly imagine and reflect on their creative output? Technology has not only resulted in more accessible tools for the production of art but has also accelerated the process by which art is funded, marketed and distributed. In the age of the internet and an increasingly connected world, the impact of an artist is no longer bound by the physical limitations of gallery. Access to art and the production or distribution tools required to leave your artistic mark are no longer exclusive to the elite or the exceptionally talented. With powerful platforms like social media and crowd-funding campaigns, today’s artists can market their innovative work to the world at a low cost. At the end of the day, to produce our imagination is an innately human act. All of us have the yearning to express ourselves, whether through words, visuals or music. As new mediums of self-expression are made more accessible to all of us, the creative possibilities are infinite.